Building on the world-wide success of the award-winning AfterBurner, AfterBurner-2 retains all the capabilities, ease of use and reliability of its predecessor with the addition of some major new features including SHA-2 hash coding. The video input now includes a programmable video quad, allowing up to 4 cameras to be recorded to DVD. Each input features motion detection, which can be set to a zone of interest with selectable sensitivity. 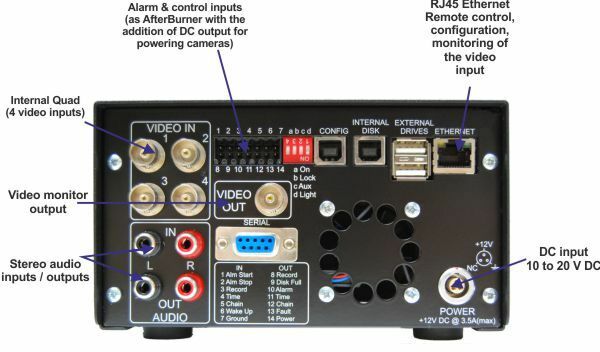 AfterBurner-2 also includes an RJ45 Ethernet port for remote control and configuration, recorded file download and taking snap-shots of the video input to ensure the cameras are functioning at the remote site. A simple webpage interface provides basic remote control and monitoring and there is a new PC application for more complex configuration. AfterBurner-2 has an internal (or optionally removable) SATA 2.5" hard drive which can address disks of up to 1 TB. This provides potentially months of video and audio recording making AfterBurner-2 the ideal video surveillance tool. Mechanical Size 155 x 90 x 260mm (as AB-1). Operating temperature range 0 to +40 deg C (with removable solid state disk -20 to +65 C). Standard accessories Mains PSU, User Guide, Power Lead. Operating voltage range 10 to 20 VDC. Typical power consumption Standby: <5mA at 12 V DC. Recording: <9W (~0.7A @ 12 V). Recording and burning: <24W (~2 A @ 12 V). DVDs supported DVD -R, +R, -RW, +RW and +R dual layer. Max DVD burn rate >x6 (typically 15 minutes, or less). Hard disk drive 250 GB (Up to 1TB possible) Removable drive version optional. Alarms User definable change of record rate on alarm or motion detection. Onscreen display Preset & user definable format of date, time, status etc. Video standards supported PAL / NTSC (auto-switching). Video I/O connectors 4 x BNC inputs, 1 x BNC output. Video input/output level 1 Vpp into 75R. Digital sampling resolution PAL: 720 pixels by 576 lines NTSC: 720 pixels by 480 lines. Video compression MPEG-2 with time-lapse capability. Video quality adjustment 5 levels. Real-time record duration 1 to 4 hours per DVD. Time-Lapse recording modes 4, 8, 12, 18, 24, 36, 48 Hours, 7 Days per DVD. (eg 24 hours rec rate, - ~2 pics / sec). Audio I/O connectors RCA Phono. Input/output level Line: ~200mV peak to peak. Ethernet Interface RJ45 socket with programmable IP address (DHCP optional) HTML Web page configuration (password protected) Download recorded files via PC application. Serial RS232 interface for control and configuration. AB2B-5517 AfterBurner-2 DVD video recorder / burner with time-lapse and networking capability. Supplied with UK mains PSU and user guide. AB2B-5518 AfterBurner 2 DVD video recorder / burner with time-lapse and networking capability. Supplied with Euro mains PSU and user guide. 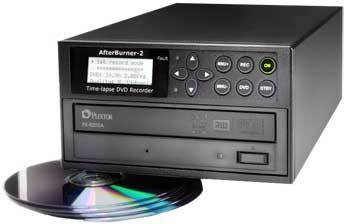 AB2B-5519 AfterBurner 2 DVD video recorder / burner with time-lapse and networking capability. Supplied with US mains PSU and user guide. Video motion detection on all 4 inputs. Ethernet port for remote control, configuration, monitoring and file download. Internal or removable SATA disk up to 1 TB. Now with SHA-2 hash coding to evidentially verify recordings.